A bicycle includes a speed-increasing mechanism interposed between the driving sprocket and the driven sprocket. The speed-increasing mechanism includes a small intermediate sprocket mounted rotatably on the frame of the bicycle, a first chain trained on the driving sprocket and the small intermediate sprocket, a large intermediate sprocket connected securely and coaxially to the small intermediate sprocket, and a second chain trained on the large intermediate sprocket and the driven sprocket. The radius of the small intermediate sprocket is smaller than that of the driving sprocket, while the radius of the large intermediate sprocket is greater than that of the driven sprocket. In one embodiment, the frame includes a generally U-shaped bracket having two symmetrical, parallel, upright side walls each of which has a notch cut formed in the upper end thereof, a shaft positioned between the side walls of the bracket, two three add holes respectively formed in two end surfaces thereof, and two lock bolts respectively extending through the notches cut of the bracket to engage with the threaded holes of the shaft so as to retain the shaft on the bracket. The large and small intermediate sprockets on same hub are journalled on the shaft. MLA Smit Patel, Meet Patel, Anand Patel, Chetan Sanghani and Diptesh Patel. "Power Magnification by Chain Drive." International Journal for Innovative Research in Science & Technology 1.9 (2015) : 1-4. APA Smit Patel, Meet Patel, Anand Patel, Chetan Sanghani and Diptesh Patel. (2015). Power Magnification by Chain Drive. International Journal for Innovative Research in Science & Technology, 1(9), 1-4. Chicago Smit Patel, Meet Patel, Anand Patel, Chetan Sanghani and Diptesh Patel. "Power Magnification by Chain Drive." International Journal for Innovative Research in Science & Technology 1, no. 9 (2015) : 1-4. Diabetes is one of the biggest health challenges in human beings in 21st century. Determination of blood glucose level is a frequently occurring procedure in diabetes care. As the most common method involves collecting blood drops for chemical analysis, it is invasive and liable to afflict a degree of pain and cause a skin injury. To eliminate these disadvantages, this project focuses on pulsed photo acoustic techniques, which have potential ability in non-invasive blood glucose measurement. The fundamental theory of photo acoustics in liquid and soft tissue will be studied systematically. The distributions of photo acoustic sources in a near-infrared optical skin model can be simulated by the Monte Carlo method. Expansion coefficient and specific heat of glucose solution will be measured by thermodynamic method, while the sound velocity in it can be determined by photo acoustic approach.The effect of glucose on blood optical scattering can be studied by a picosecond pulsed laser. A photo acoustic apparatus comprising a pulsed laser diode and a piezoelectric transducer can be built and applied to measure glucose concentration in water and scattering media. Moreover, this apparatus can be used to non-invasive experiment on human fingers. MLA Kanduru Sairam and C.H.Renumadhavi. "A Review On Non-Invasive Blood Glucometer Based On Photoacoustic Method." International Journal for Innovative Research in Science & Technology 1.9 (2015) : 5-9. APA Kanduru Sairam and C.H.Renumadhavi. (2015). A Review On Non-Invasive Blood Glucometer Based On Photoacoustic Method. International Journal for Innovative Research in Science & Technology, 1(9), 5-9. Chicago Kanduru Sairam and C.H.Renumadhavi. "A Review On Non-Invasive Blood Glucometer Based On Photoacoustic Method." International Journal for Innovative Research in Science & Technology 1, no. 9 (2015) : 5-9. Automated teller machines (ATMs) are well known devices typically used by individuals to carry out a variety of personal and business financial transactions and/or banking functions. ATMs have become very popular with the general public for their availability and general user friendliness. ATMs are now found in many locations having a regular or high volume of consumer traffic. For example, ATMs are typically found in restaurants, supermarkets, Convenience stores, malls, schools, gas stations, hotels, work locations, banking centers, airports, entertainment establishments, transportation facilities and a myriad of other locations. ATMs are typically available to consumers on a continuous basis such that consumers have the ability to carry out their ATM financial transactions and/or banking functions at any time of the day and on any day of the week. Access card authentication is critical and essential for many modern access control systems, which have been widely deployed in various government, commercial, and residential environments. However, due to the static identification information exchange among the access cards and access control clients. MLA Adhikesavan.S and N.Sathish. "On the Security of an Efficient Dynamic Auditing Protocol in Cloud Storage." International Journal for Innovative Research in Science & Technology 1.9 (2015) : 10-17. APA Adhikesavan.S and N.Sathish. (2015). On the Security of an Efficient Dynamic Auditing Protocol in Cloud Storage. International Journal for Innovative Research in Science & Technology, 1(9), 10-17. Chicago Adhikesavan.S and N.Sathish. "On the Security of an Efficient Dynamic Auditing Protocol in Cloud Storage." International Journal for Innovative Research in Science & Technology 1, no. 9 (2015) : 10-17. The Security has become an essential part of our daily life, and many organizations realize that the Security can be a major issue to protect data from unauthorized person. In this project, we are going to deals with data hiding in compressed video. Unlike data hiding in images and raw video which operates on the images themselves in the spatial or transformed domain. We target the motion vectors used to encode and reconstruct both the forward predictive (P)-frame and bidirectional (B)-frames in compressed video. The choice of candidate subset of these motion vectors are based on their macro block prediction error, which is different from the approaches based on the motion vector attributes such as the magnitude and phase angle, etc. A greedy adaptive threshold is searched for every frame to achieve robustness while maintaining a low prediction error level. The secret message bit stream is embedded in the least significant bit of both components of the candidate motion vectors. The method is implemented and tested for hiding data in natural sequences of multiple groups of pictures and the results are evaluated. The evaluation is based on two criteria: minimum distortion to the reconstructed video and minimum overhead on the compressed video size. Based on the criteria, the proposed method is found to perform well and is compared to a motion vector attribute-based method from the literature. MLA Rohit Nagargoje, Manish Raka, amrut pol and B.B.Gite. "Embedded Hiding and Extracting Secret Data in Compress Video File." International Journal for Innovative Research in Science & Technology 1.9 (2015) : 18-22. APA Rohit Nagargoje, Manish Raka, amrut pol and B.B.Gite. (2015). Embedded Hiding and Extracting Secret Data in Compress Video File. International Journal for Innovative Research in Science & Technology, 1(9), 18-22. Chicago Rohit Nagargoje, Manish Raka, amrut pol and B.B.Gite. "Embedded Hiding and Extracting Secret Data in Compress Video File." International Journal for Innovative Research in Science & Technology 1, no. 9 (2015) : 18-22. In this paper we have investigated the stability nature of Hopf bifurcation in a two dimensional nonlinear differential equation, popularly known as the Brusselator model. The Brusselator model exhibits supercritical Hopf bifurcation for certain parameter values which marks the stability of limit cycles created in Hopf bifurcations. We have used the Center manifold theorem and the technique of Normal forms in our investigation. MLA Hemanta Kr. Sarmah., Mridul Chandra Das. and Tapan Kr. Baishya. "HOPF BIFURCATION IN A CHEMICAL MODEL." International Journal for Innovative Research in Science & Technology 1.9 (2015) : 23-33. APA Hemanta Kr. Sarmah., Mridul Chandra Das. and Tapan Kr. Baishya. (2015). HOPF BIFURCATION IN A CHEMICAL MODEL. International Journal for Innovative Research in Science & Technology, 1(9), 23-33. Chicago Hemanta Kr. Sarmah., Mridul Chandra Das. and Tapan Kr. Baishya. "HOPF BIFURCATION IN A CHEMICAL MODEL." International Journal for Innovative Research in Science & Technology 1, no. 9 (2015) : 23-33. Recently, the importance of exploring the plausibility of renewable energy has been progressively increased, not only because of concerns over the shortage of current fossil fuels but also the consideration of sustainable development and the negative environmental impact caused by large scale use of fossil fuels. Among renewable sources, solar energy seems to be one of the promising energy sources for widespread application. Due to its inherent intermittency and fluctuation, one of the important research interests is to harness the maximum power possible from the solar energy falling on a panel. Maximum power point tracking (MPPT) is a very important necessity in a system of energy conversion from a renewable energy source. Many research papers have been produced with various schemes over past decades for the MPPT in photovoltaic (PV) system. This paper inspires its motivation from the fact that the keen study of these existing techniques reveals that there is still quite a need for an absolutely generic and yet very simple MPPT controller which should have all the following traits: total independence from systemâ€™s parameters, ability to reach the global maxima in minimal possible steps, the correct sense of tracking direction despite the abrupt atmospheric or parametrical changes, and finally having a very cost-effective and energy efficient hardware with the complexity no more than that of a minimal MPPT algorithm like Incremental Conductance. The MPPT controller presented in this paper is a successful attempt to fulfill all these requirements. It extends the MPPT techniques found in the recent research papers with some innovations in the control algorithm. The simulation results confirm that the proposed MPPT controller is very fast, very efficient, very simple and low cost as compared to the contemporary ones. MLA Girish P Ahire, Prof. R. P. Hasabe and Prof. Dr.A. P Vaidya. "An Incremental Conductance based Maximum Power Point Tracking for a PV Array Operating under Nonuniform Irradiance." 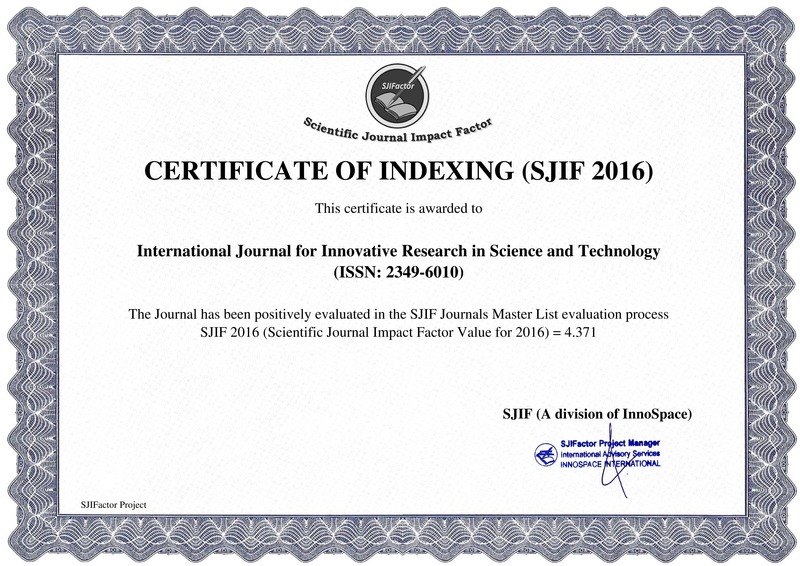 International Journal for Innovative Research in Science & Technology 1.9 (2015) : 34-42. APA Girish P Ahire, Prof. R. P. Hasabe and Prof. Dr.A. P Vaidya. (2015). An Incremental Conductance based Maximum Power Point Tracking for a PV Array Operating under Nonuniform Irradiance. International Journal for Innovative Research in Science & Technology, 1(9), 34-42. Chicago Girish P Ahire, Prof. R. P. Hasabe and Prof. Dr.A. P Vaidya. "An Incremental Conductance based Maximum Power Point Tracking for a PV Array Operating under Nonuniform Irradiance." International Journal for Innovative Research in Science & Technology 1, no. 9 (2015) : 34-42. This paper describes bidirectional DC-DC converter fed separately excited dc motor for EV application. Battery fed electric vehicles (BFEVs) is required to function in three different modes namely: normal (steady-state) mode, acceleration mode and braking (regenerative) mode. During acceleration and normal modes the power flow is from battery to motor whereas during braking or regenerative mode the kinetic energy of the motor is converted into electrical energy and fed back to battery. MLA Yakub Anwar Makandar and Prof. S.S.Vanamane. "Performance Analysis of Bidirectional DC-DC Converter for Electric Vehicle Application." International Journal for Innovative Research in Science & Technology 1.9 (2015) : 43-49. APA Yakub Anwar Makandar and Prof. S.S.Vanamane. (2015). Performance Analysis of Bidirectional DC-DC Converter for Electric Vehicle Application. International Journal for Innovative Research in Science & Technology, 1(9), 43-49. Chicago Yakub Anwar Makandar and Prof. S.S.Vanamane. "Performance Analysis of Bidirectional DC-DC Converter for Electric Vehicle Application." International Journal for Innovative Research in Science & Technology 1, no. 9 (2015) : 43-49. Influence of Motivating Factors on Sales Employee Retention in Private Life Insurance Companies. This paper aims at developing insight on how employee retention is relevant in the private life insurance Companies in India. This study identifies motivating factors defined by Fredrick Herzberg in his Two Factor theory of motivation on sales employee retention in the private life insurance sector in India. These studies also elaborates the influence of motivating factors on the sales employee job satisfaction and further the extent of the influence on the employee retention. The main objective is to understand the nature of the motivating factor, their relation with the job satisfaction and its influence on the employee retention. This study also helps to find out the factors which are highly responsible for the retention in private life insurance companies in India. MLA Prof. Sandip Shahuraj Shinde. "Influence of Motivating Factors on Sales Employee Retention in Private Life Insurance Companies.." International Journal for Innovative Research in Science & Technology 1.9 (2015) : 50-56. APA Prof. Sandip Shahuraj Shinde. (2015). Influence of Motivating Factors on Sales Employee Retention in Private Life Insurance Companies.. International Journal for Innovative Research in Science & Technology, 1(9), 50-56. Chicago Prof. Sandip Shahuraj Shinde. "Influence of Motivating Factors on Sales Employee Retention in Private Life Insurance Companies.." International Journal for Innovative Research in Science & Technology 1, no. 9 (2015) : 50-56. This paper proposes a Comparison for Different Mother Wavelet For Fault Detection & Classification of Series Compensated Transmission Line. Voltages and currents with fault signal can be properly analyzed by using the wavelet transform. However, the effectiveness of the wavelet analysis is largely influenced by the choice of the mother wavelet. This paper evaluates seven different mother wavelets: Haar, Daubechies, Symlets, Coiflet, BiorSplines, Reverse BiorSplines, Meyer families. Fault Detection & Classification is done on the basis of % Energy of Current Signal. The Matlab Wavelet Toolbox is used for Calculation of % Energy of Current signal. MLA Nitin Uttam Gawali, Prof. R. P. Hasabe and Prof. Dr.A. P Vaidya. "A Comparison of Different Mother Wavelet For Fault Detection & Classification of Series Compensated Transmission Line." International Journal for Innovative Research in Science & Technology 1.9 (2015) : 57-63. APA Nitin Uttam Gawali, Prof. R. P. Hasabe and Prof. Dr.A. P Vaidya. (2015). A Comparison of Different Mother Wavelet For Fault Detection & Classification of Series Compensated Transmission Line. International Journal for Innovative Research in Science & Technology, 1(9), 57-63. Chicago Nitin Uttam Gawali, Prof. R. P. Hasabe and Prof. Dr.A. P Vaidya. "A Comparison of Different Mother Wavelet For Fault Detection & Classification of Series Compensated Transmission Line." International Journal for Innovative Research in Science & Technology 1, no. 9 (2015) : 57-63. Cognitive Radio (CR) is an emerging technology for future wireless communication and technology. In the existing system, there is a multiple allocation over all the bands and also there is a crisis for spectrum availability, therefore a new approach for spectrum licensing is needed. Hence the optimal solution for the above case is cognitive radio. the resource-allocation problem in multihop CR networks is modeled as a multicommodity flow problem. To solve this problem, the queue-balancing flow control method is proposed. Considering the characteristics of CR, we adopt the queue-balancing to multihop CR networks with varying link capacity and dynamic spectrum conditions. Using the queue-balancing framework, we analyzed distributed resource allocation. The data rate, power, and channel allocation are determined by the local queue size and adjusted to reflect the status of channels and the throughput requirement on each link. The optimal rate control for each session on a link is derived first. Power allocation at nodes is divided into two levels, which are the power allocation between links and the water-filling power allocation for the channels within a link. Coordination between links for channel allocation is achieved by exchanging some control messages between neighboring nodes according to the estimated channel-holding utilities for each channel on a link. We also proposed a time based scheme in order to change the spectrum dynamically to avoid data stagnation. MLA T Karthikeyan, B Shivashankar, M Selvakumar and E Mohanraj. "An Effective Data Distribution Using Resource Allocation in CR Networks through Balanced Queue." International Journal for Innovative Research in Science & Technology 1.9 (2015) : 64-69. APA T Karthikeyan, B Shivashankar, M Selvakumar and E Mohanraj. (2015). An Effective Data Distribution Using Resource Allocation in CR Networks through Balanced Queue. International Journal for Innovative Research in Science & Technology, 1(9), 64-69. Chicago T Karthikeyan, B Shivashankar, M Selvakumar and E Mohanraj. "An Effective Data Distribution Using Resource Allocation in CR Networks through Balanced Queue." International Journal for Innovative Research in Science & Technology 1, no. 9 (2015) : 64-69.